Lisa Lund CRC MFT presents the Gottman Method Workshop "Level 1 : Bridging the Couple Chasm" Training. Lisa Lund is an accomplished trainer and sought-after speaker known for her energetic and entertaining presentations for both professional and lay audiences, including corporate settings, universities, conferences and community agencies. She is a Licensed Marriage and Family Therapist; a Certified Rehabilitation Counselor; and a Master Certified Gottman Therapist, Trainer, and Consultant. The workshops are presented in a “Professional Retreat” setting just minutes north of San Francisco and the Golden Gate Bridge at the SF Theological in San Anselmo. Please see registration for venue photo’s and more information. Drs. 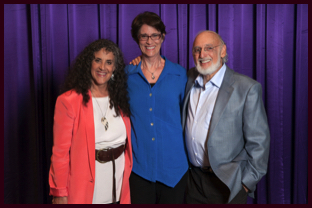 John and Julie Gottman. trains clinicians to use the Gottman Method.